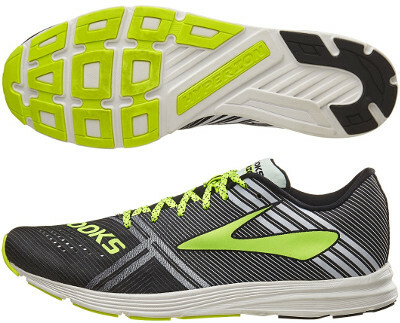 Brooks Hyperion are neutral racing running shoes. The radical Brooks Hyperion is a really light shoe to run as fast as possible. After 5 years guys from Brooks have decided to release a successor of the legendary Racer T7, one of the most popular racing flat out there despite growing demand of competitors like New Balance 1400 v4 or Adidas Adizero Adios Boost 3. As a summary, the Hyperion is a great choice for any kind of fast runs from interval training to marathon racing, although typical usage would be 5k or 10k competitions. Striking upper from Hyperion is made of one piece of elastic fabric featuring snug fit. Ventilation holes located in both internal and forefoot areas provide some ventilation but definitely breathability is an issue in such narrow shoe. There is an stiff counter embedded in the curved heel to provide enough consistency necessary for fast transition. Midsole is basically one-piece BioMoGo DNA foam (already seen in bigger sibling Brooks Launch 3) featuring firm but soft touch and superb response to run fast. Outsole will not be more durable ever seen and combines foam and not much blown rubber, just enough to provide enough grip in road races. Flexible grooves and "propulsion pods" in the forefoot facilitate an agile transition and quick toe-off.